Yep, that's Dane Cook giving his best American Psycho impression (at least that's what it looks like). Sci-fi site io9 recently interviewed music video director Joseph Kahn (also of Torque) and unveiled three first look photos from his new film Detention. It's described as "Back To The Future meets Scream, with a hefty dose of John Hughes teen movies." In addition to Dane Cook, it also stars Shanley Caswell, Josh Hutcherson and Spencer Locke. Kahn recently wrapped a 51-day shoot and is now entering post-production. Detention is essentially a horror comedy featuring a crazy slasher-movie killer named Cinderhella, who's also seen below. If that slasher villain (upper right corner) looks a bit cheesy, that's supposed to be the case. 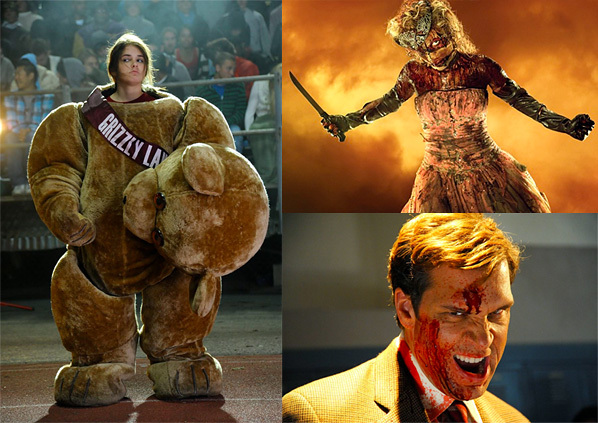 io9 describes her as "a suitably tongue-in-cheek prom-queen pastiche of Chucky and the like." I just hope she doesn't ruin the movie. Detention is actually about a 17 year old who's given detention on the night of her senior prom, hence the John Hughes aspect, which is when this crazy Cinderhella starts killing off her friends. It looks quite fun and I'm curious how the time-travel aspect fits in too, but Kahn says "it's kind of indescribable genre-wise," so I think we're in for something unique either way. We'll be sure let you know anything we hear about this! it may end up being good; but, right now it sounds like a bomb of nuclear proportions. Very random collection of images. The premise is interesting but I'll need to see a trailer before getting too excited. beavis said it all. good to see Cook taking on a wacky psycho killer role. This movie looks sick!Those images are promising and@2, I'm with you, I'd need to see a trailer first before I'd get excited. Joseph Kahn has huge amounts of talent... too bad he made torque (although it looked FREAKIN cool)... Give him the Transformers franchise after Bay. Hmmm, sounds like Trick'r Treat in some way. We'll see.